Knock Out roses are the perfect choice for gardener's who prefer low maintenance plants. The knock Out rose also has the ability to adapt to partial shade situations. These roses have attractive glossy foliage that is naturally disease resistant. Even better, these roses are in bloom all summer long. At maturity they range between 3 and 4 feet tall. All of the Knock Out roses were developed by the breeder Bill Radler. Rosa 'Radrazz,' was the first Knock Out rose. It has single cherry red petals. Because it was the first variety, it has no common name, simply Knock Out rose. It received an award in 2000 by the AARS (All American Rose Selections), for being an outstanding rose. Since then another red rose was developed called the Double Knock Out rose (Rosa 'Radtko'). This one is the same color but with fuller double petals. It is even more shade tolerant than the first Knock Out rose. The Double Knock Out rose has slightly lighter edges, giving it a multi-colored appearance. Due to the vibrant color, red Knock Out roses make good low hedge plants. They are valuable for this application since they can thrive in difficult situations. Plant a row along a driveway or in hot areas where other plants might suffer. Knock Out roses are hardy to USDA zone 5. 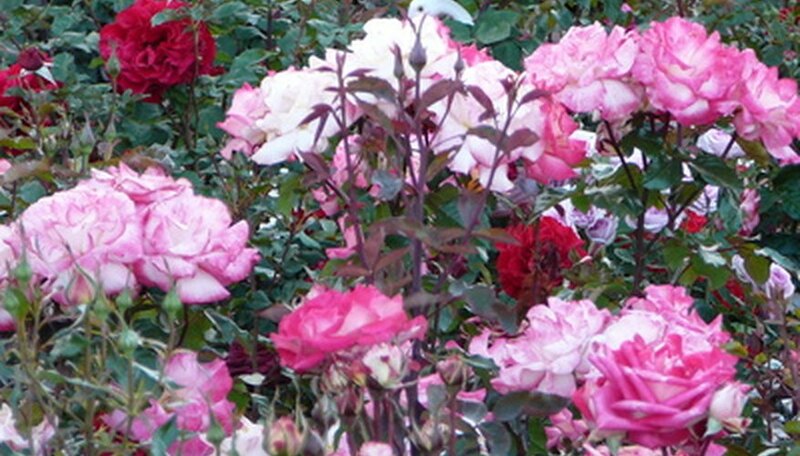 There are more pink varieties of Knock Out roses than any other color. There are two darker pink varieties. The first one is a single-petaled rose called Pink Knock Out rose (Rosa 'Radcon'). There is also a Double pink Knock Out rose (Rosa 'Radco Pink'). The number of petals are the only real difference between the two dark pink varieties. The Rainbow Knock Out rose (Rosa 'Radcor') has a single coral pink flower with a bright yellow center. This is the only Knock Out rose that is two-toned in color. The AARS deemed Rainbow Knock Out rose even hardier than its predecessors. Another pink variety, the Blushing Knock Out rose (Rosa 'Radyod') has pastel pink blossoms. Though the flowers are single, they are cupped, giving this rose a fuller appearance. There is only one yellow Knock Out rose to date. It is called the Sunny Knock Out rose (Rosa 'Radsunny'). This variety stands out because it has more fragrance. For all of their virtues, the other Knock Out roses have little or no scent. This is a slightly smaller shrub with a tighter appearance. Yellow Knock Out rose is a single petaled variety. It begins the growing season a solid yellow color and turns to a creamy white as the days turn warmer. This is the closest the breeder has come to a white Knock Out variety. Bill Radler has recently developed a white rose called White Out (Rosa 'Radwhite'). It is not considered a Knock Out rose and does not have the same hardiness, or disease resistance. What Is the Meaning of Roses Quantity? How Do Roses Get Their Color?